I was hunting for a corn bread recipe recently and found myself leafing through a decrepit copy of Fannie Farmer’s Boston Cooking School Cookbook. I don’t use it often, but keep it in my collection because of its venerable age and the dear departed friend who owned it before me. The pages of this 1906, 2nd edition, “cutting edge” cookbook are yellowed and brittle as you might expect of a 109 year old book. 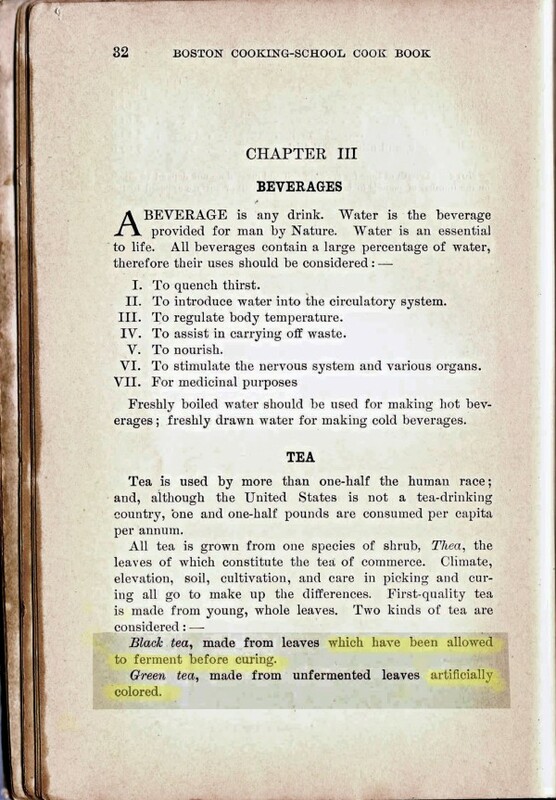 As I browsed delicately through the contents, my eyes went straight for the ‘T’s’ and I found Tea on pg 32 – a page and a half of information about the tea plant, virtues of the beverage, how to prepare. Quite amusing and some of it laugh out loud hilarious. There’s too much to post in one go, so I’ll break it up into several doses. 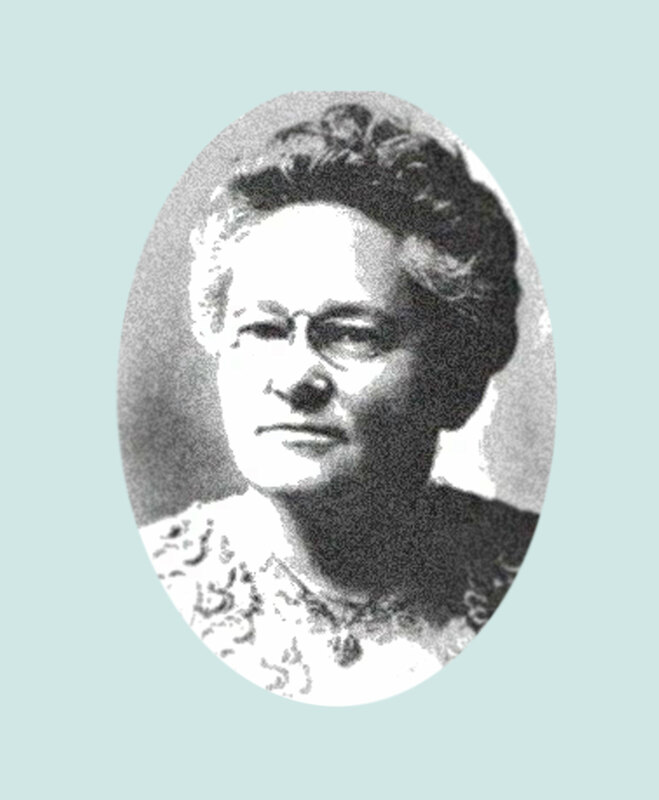 Fannie Merritt Farmer (1857-1915) was considered a trail blazer in the world of home cookery, being the first to use standardized measuring spoons and cups (with level measurements) in her recipes – no more “thimble full” or “juice glass full” or other vague and subjective ways of measuring. She started as a student at the Boston Cookery school and eventually became principal – quite an accomplishment on its own, but add to that her perseverance through a physical handicap from a teenage stroke that left her with a limp, and you can imagine her determination. Her specialty was food science and nutrition. Having the latest information to draw on, her short summary of tea and its properties would have been compelling information at the time. I’ve highlighted some points of interest. Under the heading “beverages” Farmer explains the benefits of drinking fluids and then moves on to tea. The first part is straight forward. She mentions “fermentation” which, I think we would all agree was the common reference at the time. We still hear the term fermentation used, but we know correctly that oxidation is the process that tea undergoes as it changes from green to black. (There is no alcohol produced at all). One thing that does stand out on the page re. black tea – “allowed to ferment before curing“. I can only guess that tea drinkers thought that tea leaves were preserved in some way like pickles or salami. 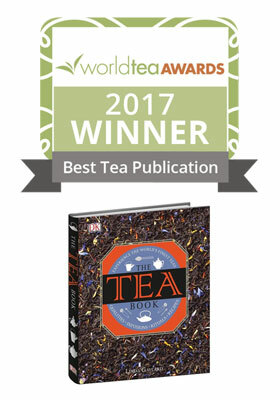 We know that they weren’t treated in a way that would prolong their shelf life, but there may have been the expectation that tea leaves had been preserved for their long ocean voyage from Asia to America. The next line seems quite shocking to the modern green tea drinker – “Green tea…artificially colored”. It’s likely that no North American at that time (other than those working on the experimental farms in South Carolina) had ever tasted a fresh green tea. 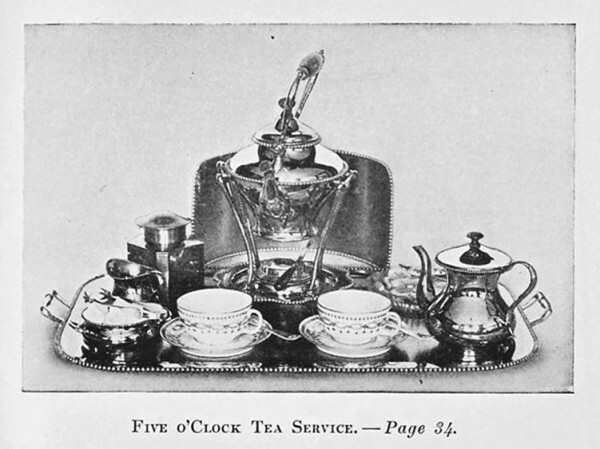 The ocean voyage, importation process, distribution and packaging would have taken many months and by the time green tea reached the kitchens of American housewives, it would be stale. Consumers would expect green tea to have a fresh looking colour. Manufacturers responded to market needs. Green tea bound for the US, likely was coloured, probably with Prussian Blue at source in Japan, where most US green tea originated. Here is an interesting post by Bruce Richardson about nineteenth century tea colour enhancements for the US market. In the late nineteenth century, coal-tar derived food additives were commonly used in the US to colour food and cosmetics, making more pleasing colours and freshening up inferior food products. It is an interesting coincidence that The Food and Drugs Act which regulated the use of food additives was passed by US Congress in 1906, the same year as this book’s publication. Fannie Farmer was just stating a fact – Americans preferred their green tea to be bright green! Its real colour was probably a shade of hay. More to come: Proteids, over-indulgence and tannic acid! Fascinating! I love to hear the way people thought and acted in the past. It’s funny to think that they coloured green tea! I agree funkyhighness. It was another world in Fannie’s day! I’ll be posting the second part of this series in a few days.